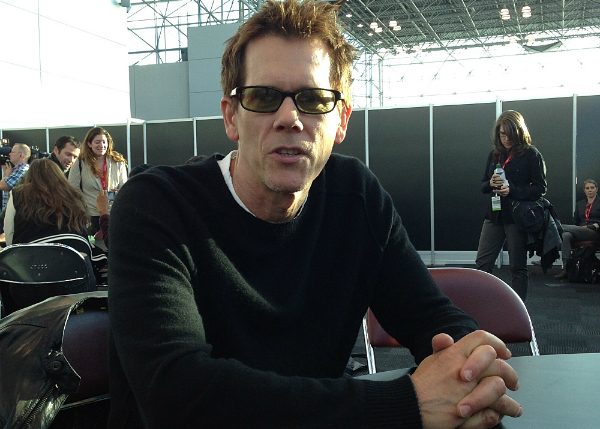 At New York Comic Con, Kevin Bacon of The Following, said his character, Ryan Hardy, will be much healthier this season than last, but admitted his Joe Carroll obsession will remain. Kevin Bacon of The Following interview below. Q: So Ryan is living a much more healthier life this season? Bacon: Yeah I got a nice little apartment. It’s on 82nd and Broadway and I am teaching at a criminal college and I am teaching criminology and forensics. It’s an interesting choice. At first I wasn’t sure about that choice but then I thought about the fact that I do have this obsession about Joe Caroll and one of the things I always admired about him was his — there were seasons last year where I was sitting there watching him teaching saying wow that guy is good. So now I am attempting that myself. I stopped drinking, going to meetings. My heart is in better shape, running and working out. Q: Do you think with all of these changes that you are more stable enough to teach a class and have a life change? Bacon: Yeah. I mean that’s the idea. Ryan Hardy is a character where his life has been surrounded by death and he has an extremely dark side and has a lot of stuff going on that may not be on the surface and that is part of what we see. But, when you met him last year he is in bed with a hangover and he is totally out of this thing, thinking this guy is in jail. Then they kind of wake him up and bring him back into it this worldwind thing — which all took place in about two weeks. It was all rammed together and this is now a passage of time, it’s a year later. Q: So is he still thinking about Joe all the time? Bacon: [nods]. Well, yes and no. I mean it’s such a hard thing to answer questions about the show because I really want the experience to be fresh and new, but I mean look, Joe killed the only woman that I ever loved. So am I thinking about him? Yeah. But I have moved on to a certain extent. So yes and no [laughs]. Q: So rumor has it, there is a new love interest in Ryan’s life? Bacon: She is — there is a crime, a really scary thing and attack and she is a victim of it and she survives and I meet her, probably crossing the line you know in a way that I shouldn’t, which is very much keeping with this character. And I am just taken by her. She is in a lot of ways, like similar to the ways I feel about Joe. She is everything that I am not. She is worldly, speaks a million languages, has an appreciation of art — is just kind of this dynamic creature. I am not out looking for love, but something about her just draws me in. Q: So what’s the journey this season? Bacon: Well, it’s a question — I always see it as a question of am I going down or am I climbing myself back up. Last year, I was at the bottom, rock bottom. The problems with the case almost started to heal me in a strange kind of way because I feed on it. This year, the journey is that I am more together, but I have to get pulled back in you know and I have to go down to the bottom again. Don’t forget to watch Kevin Bacon in The Following on FOX starting in 2014.